State Street & Train, looking north. Friends of Library, Gift of Mrs. Thos. Allen. The brick bank building on the corner of State St. and A Ave. before 1906 when the building burned. 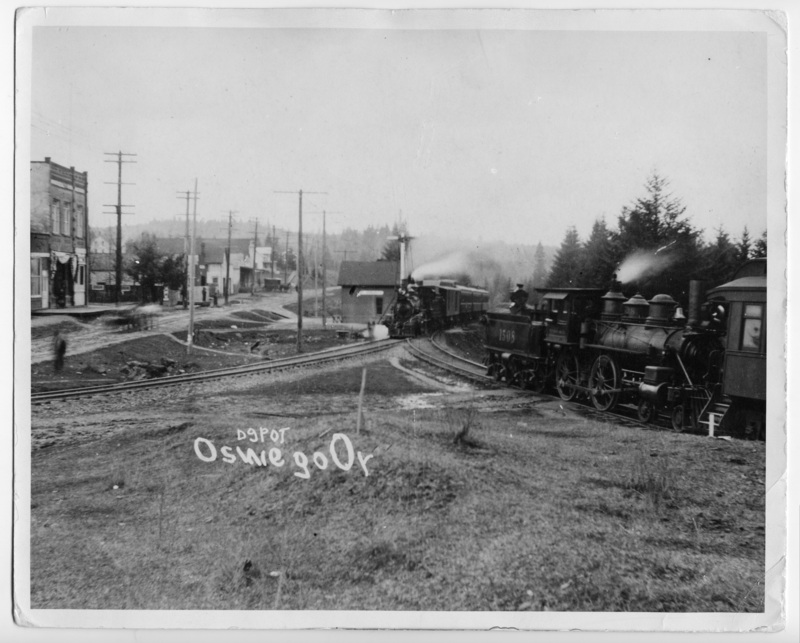 [View of Oswego's "Front Street" now State Street and the Southern Pacific Station. The brick building on the corner of State and A Avenue dates this picture before 1906 when the building burned. The Southern Pacifc tracks, then narrow guage (sic) were widened in 1909. The small building adjoining the brick structure was the post office from 1894-1897 while E.J. Russell was postmaster and had the office in his tin shop. The next postmaster, G.W. Prosser, built a store beside the tin shop for the post office in the 1900s.] 1st library there in 1895. Description Creased and chipped edges. Same as 151b - g, 1400, 1657, 2483, 2971, & 5672 although they may be cropped differently. Imprinted on front: depot Oswego Or. Numbers on engine and car: 1508, 2001. Lettering on car: Southe[rn]. Transcription State Street & Train, looking north. Friends of Library, Gift of Mrs. Thos. Allen. The brick bank building on the corner of State St. and A Ave. before 1906 when the building burned. [View of Oswego's "Front Street" now State Street and the Southern Pacific Station. The brick building on the corner of State and A Avenue dates this picture before 1906 when the building burned. The Southern Pacifc tracks, then narrow guage (sic) were widened in 1909. The small building adjoining the brick structure was the post office from 1894-1897 while E.J. Russell was postmaster and had the office in his tin shop. The next postmaster, G.W. Prosser, built a store beside the tin shop for the post office in the 1900s.] 1st library there in 1895.